The first month of the semester has flown by and autumn weather is almost upon us. If you are looking for a great way to get outside and enjoy the changing seasons, you really don’t have to go too far. Saturday, September 27th 9am-3pm is the Hike-A-Thon Plus, an event that brings together students and draws in community members from Oxford and beyond to explore the Miami University Natural Areas. “It’s a day of adventure and learning and exploring!” said Jim Reid, Field Manager of the Natural Areas. Why the plus? This will be the first year the event will be including “Take-a-Hike-for-Charity.” For every mile hiked, donors have pledged to contribute $4.50 to the charities: Oxford Community Choice Pantry; Hamilton Animal Adoption Foundation and Smile Train. There will be 29 different events, demonstrations, and activities enjoyable for all ages. Included in these will be the tours offered of the Dewitt House, letterboxing demonstrations, and an orienteering demonstration. Those who walk at least three miles will be eligible for free Take-A-Hike shirt, so long as supplies last. With Hike-A-Thon being one of the leading environmental events in the area, it is expected that this year will bring in over 1000 participants. 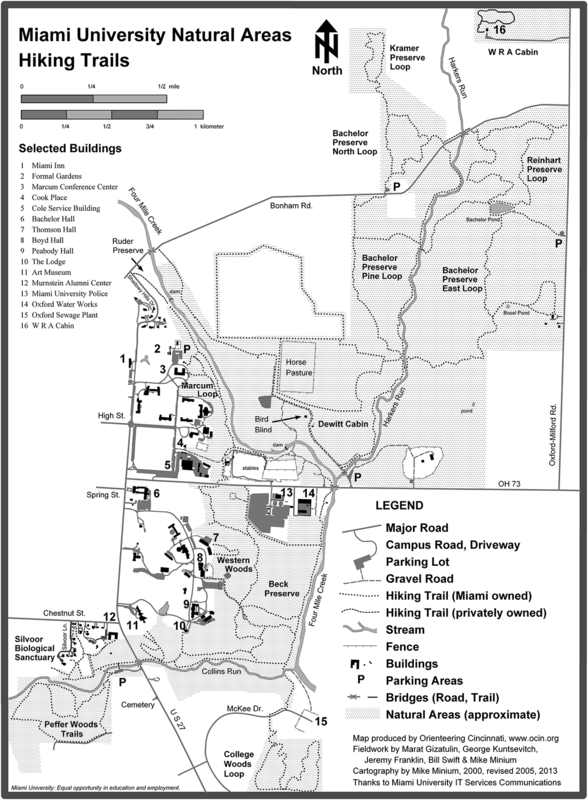 Most students at Miami University are unaware of these natural areas. With over 1000 acres and 17 miles of hiking trails, we have access to some of the most beautiful wildlife in southwestern Ohio. Hike-A-Thon is a fantastic way to get outdoors locally and be introduced to the Miami University Natural Areas, so be sure to check it out next weekend! Directions to the Hike-a-Thon Plus: From Oxford, at the intersection of Rt 27 and Rt. 73, go East on Rt. 73 and continue .7 miles to park on the left (north) side of the road. There will be signage the day of the event.